"The shambler tree is the answer to the question: can a tree walk? The answer is: yes it can, but only if it becomes an animal." Sometimes, an organism will have both characteristics of a plant (for example, ability to photosynthesize, has leaves, flowers, and other plant parts) and characteristics of an animal (the ability to move around at will and it resembles a familiar creature). Scientists don't know how to classify it. We like to call it a Planimal. Fungus-animal hybrids also belong here: even though fungi are more closely related to animals than to plants, fiction treats them as the same thing often enough for them to count for this trope. May cross over with Plant Mooks if they are treated as disposable cannon fodder. See also Man-Eating Plant for carnivorous plants that may or may not show animal traits and Plant Person, Sister Trope for sentient humanoid cases, and Plant Aliens, the science fiction counterpart. The goldfish plants from Hoozuki no Reitetsu. Unlike most examples, they do not have the ability to propulse themselves. They are literally chubby goldfish wiggling around atop a thick, leafy stem. They can also grow up to three meters in height and are apparently edible. Part IV of Jojos Bizarre Adventure has a cat whose Stand (a sort of psychic extension of the self) revived it as a plant, after its untimely death. The 'cat-plant' is a plant, no doubt about that, but it also has eyes and a mouth, and acts exactly like it used to in its former kitty-cat life. Of course, the best part is probably that it can use air, of all things, to potentially blow your freaking head off. The main character of Dogtato-kun is a dog-potato hybrid. There's also a hedgehog mixed with a sweet potato named "Hedgetato". The Ten-Tailed Beast from Naruto was once a supernatural/extraterrestrial tree, and while in its incomplete states it appears more animal than plant it has bark-coloured skin, a bulb-like protrusion on its back, can manifest in a tree-like form, project chakra-draining roots, and fire giant wooden stakes. Its third form has Nested Mouths resembling a Rafflesia flower. Godzilla: Planet of the Monsters: Godzilla and its Servum offshoots are described as having originated as plants, despite possessing metallic tissue. Every Grass-type Pokemon is this, either resembling a specific type of plant like the Bellsprout line, or having plants growing out of their bodies like the Bulbasaur line. In addition, they can use photosynthesis, root themselves to the ground, or release spores. One story in the Anthology Comic Batman Chronicles #9 had her create a plague of strawberry-mice, apparently just to attract Batman's attention because she was bored being cooped up in Arkham. According to the DC Super Pets Character Encyclopaedia, she has a dog-shaped bush named Dogwood. Biollante from Godzilla vs. Biollante originated as a rose that was infused with tissue samples taken from Godzilla and the DNA of a human girl, which enables her ghost to possess it. Supplemental material for Kong: Skull Island and the tie in comic Skull Island: The Birth of Kong states several of Skull Island's creatures are this. Gremlins 2: The New Batch: After drinking a potion from the science lab, a Gremlin turns into a Gremlin/Vegetable hybrid. Troll 2: (Nothing to do with the original Troll) features goblins (not Trolls) which turn people into edible plantmen because they are vegetarians. Apes and wolves made out of plants played an important role in Lady in the Water. In Batman & Robin, Poison Ivy tries to create creatures like this so plants can finally fight back against humans. She even shows a first example of her creations to Mr. Freeze. A major theme throughout Una Woodruff's Amarant: The Flora and Fauna of Atlantis; most of the "fauna" are actually motile seed- or pollen-carrying stages of plants. The Ents from the The Lord of the Rings which are "Tree Shepherds": essentially trees that walk, talk, think and kill orcs. The vinhogs from Iron Council are giant swine with grapevines growing out of their backs. They're herded for wine. The "Groveback" creatures of Darwin IV, from Wayne Barlowe's Expedition (later made into Alien Planet). The titular triffids from The Day of the Triffids are carnivorous plants which are worryingly intelligent and move using their lower branches like crutches. They are implied to be the work of Soviet scientists in the Cold War. As it turns out in Speaker for the Dead, every native animal on Lusitania is one of these, and they undergo metamorphosis, turning from plant to animal. In The Future Is Wild, 200 million years from now, garden worms store photosynthetic algae inside long fern-like appendages on their backs. They emerge from damp caverns to bask in sunlight, letting their algae generate sugars. In the Humanx Commonwealth Verse, furcots (from Midworld and Mid-Flinx) are huge, green, bear-like hexapods that live as Bond Creatures with humans. They emerge from seeds and gain nourishment by photosynthesis. In the The Iron Teeth web serial there large stick bug-like beasts that mimic trees and attack animals or people who get to close. They fit this trope because part of their disguise is that they have actual symbiotic plants growing from them. Tremors the Series is the Trope Namer. 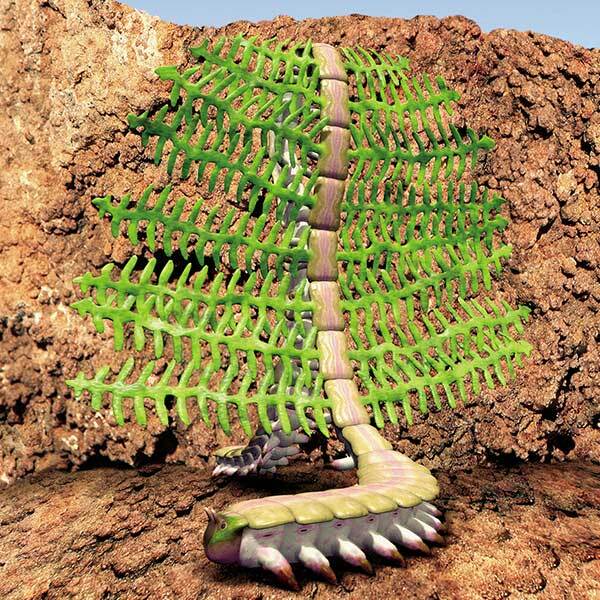 The Planimal was a plant/root/thing, but also has a circulation system. It was a mixture of DNA from the Pitcher Plant, Venus Fly Trap and some sort of lizard. A few pop up in Farscape. Zhaan is a Plant Person but has a lot of animal traits; one food her people cultivate is explicitly partly like a plant and animal. The "Dangerous Beauty" challenge on Face/Off required contestants to blend an exotic animal and plant of their choice. The Future Is Wild has the Garden Worm ◊. 200 million years from now, these worms have strange appendages filled with algae, which photosynthesize to produce nutrients for the Garden Worm. Return of Ultraman. One Kaiju of the Week was Leogon, a hybrid of animal and plant created by a brilliant but misguided scientist. Interestingly, the guy who wrote the episode would later produce the first draft of the script for Godzilla vs. Biollante mentioned above. The Vegetable Lamb of Tartary. It's actually just a cotton bush... and a fern rhizome. It's a complicated story. Wired has a fairly good article on it. Yu-Gi-Oh! features a variety of different planimals from Ent creatures to walking plants. The Orks of Warhammer 40,000 fame are a genetically engineered Super Soldier race created from a combination of vertebrate, fungus and algae DNA. As a result, they have green skin, a spore-based reproductive process that means that any planet they're on will be perpetually infested by them, and they can potentially convert a planet's entire biosphere into an Orkoid fungal environment given enough time and population. In Little Shop of Horrors, Audrey II is a plant crossbred from a butterwort and a Venus flytrap, but has vocal chords and apparently, a full digestive system in its stalk. The film adaptation justifies this by making it an extraterrestrial. The Pikmin themselves are little plant people — essentially, they're humanoid, ambulatory root structures with leaf-, bud- or flower-tipped stems growing from their heads. Their exact metabolism isn't specified, but they at least eat like animals do. The Creeping Chrysanthemum is much like the Pikmin — it's technically a plant (a member of the daisy family, specifically), but its roots have developed into true limbs, allowing it to dig itself free of the ground and lumber after its prey. Regular and Desiccated Skitterleaves are insects crossed with leaves (living ones and dead brown ones, respectively) — unlike many insects which simply mimic leaves for camouflage, their bodies and limbs appear to be outright made of leaves and stems. The Pellet Posies are a very plant-leaning case — they're regular flowers (by the game's standards) in most respects, but Olimar notes that they have muscle fibers in their stems. In Pokémon, pretty much every Grass-type falls into this to some degree, and although many lean more towards being some sort of Plant Person, animated plant or Nature Spirit, some examples stand out above the rest. All of the Grass-type starters are some sort of planimal or another. In some cases, they lean much more heavily towards being animals than plants (Chesnaught and Dartrix, for instance, are essentially just and armadillo and an owl that manipulate plants) but in other cases, the plant side is more obvious (such as the large, showy flower growing on Venusaurs back). Abomasnow is technically an animated evergreen, but it looks far more like a yeti than a plant. Pansage and Simisage are monkeys with what appears to be grass and leaves instead of fur. 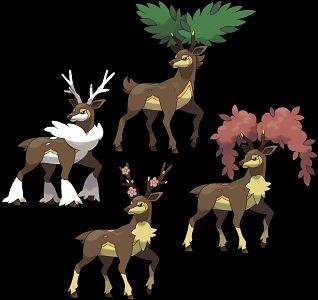 Sawsbuck is one of the best fits: its a deer whose antlers are living branches, gaining and losing foliage and flowers with the seasons. Skiddo and Gogoat are otherwise normal-looking goats with manes and tails of living foliage. Fomantis and Lurantis are unusual cases. While theyre clearly based off of orchid mantises, which mimic flowers to ambush prey, theyre pure Grass-types, and dont have the Bug-type. The implication is that, unlike the other, animal-leaning examples, they are actual plants that began to mimic animals instead of the other way around. Spore allows you to make anything. This allows you to make creatures that resemble Planimals, but since it's impossible to give them an actual plant-like biology, it's never more than an aesthetic difference. The Japanese casual browser game Vegemon Farm has hundreds of Planimal type creatures. SimEarth let you raise carnivorous plants to sentience and create a civilization, even high-tech space-faring plant life. Super Scribblenauts allows you to add "wooden" to anything. You can also use "plant" as an adjective for anything and create carnivorous plants and treants. Spore plants in Fallout, one of which became sentient. They return in Fallout: New Vegas alongside the "Spore Carriers", infected humans who have become mindless brutes covered in moss with various plants growing off of them. The Kikwis of The Legend of Zelda: Skyward Sword look like a mix between a flowering plant, a beaver, and a Kiwi. The Koroks from The Legend of Zelda: The Wind Waker are vaguely person-shaped wooden figures with leaf masks. Apparently, they used to be the much more human-like Kokiri from The Legend of Zelda: Ocarina of Time. The Deku Scrubs from Ocarina of Time and Majora's Mask are small wooden humanoid creatures that live just under the surface of the ground and will either sell you something or spit deku nuts at you. The Deku Baba which appears in the 3D games is a carnivorous plant similar to the Piranha Plant from the Mario series. A recurring enemy in the games is the Peahat , which, while not quite as animalistic or humanoid as most, is both mobile and more than a little dangerous. Odin Sphere has Baromett plants, which grow sheep. Probably inspired by the Vegetable Lamb of Tartary mentioned under 'Mythology'. Most of the martian wildlife in the Ultima spinoff Martian Dreams are ambulatory, sapient plants, while the animal kingdom consists solely of subterranean worms. Even the civilized Martians were some variation of gourd. Humorously, they refer to the visiting humans as "worms", not as an insult, simply because it's the closest thing they can recognize us as. Lashers from World of Warcraft are flowers that walk around on tentacle-like vines and whip enemies with a pair of thorny vines that serve as their "arms". Ochu and Malboro from Final Fantasy are mobile, toothy plants; the Malboro even breathes like an animal, by inhaling and exhaling through its mouth. Legend of Grimrock's Herders aren't technically planimals, since they're sentient (or at least aggressive and mobile) mushrooms, but it's close enough. The Mother series has a number of these. EarthBound Beginnings has Woodahs and Big Woodahs (both being trees). EarthBound has two kinds of Mobile Sprouts, Demonic Petunias, two kinds of Hostile Oak and two varieties of walking mushroom. MOTHER 3 has two kinds of Beanling, Cactus Wolves, Muttshrooms, Yammonsters (regular, Baked and Grated), Pigtunias, Tiny Forests, two kinds of Tree, three types of walking mushroom, and Walking Bushies. The Falcon Elm from CreaVures, which is a giant bird rooted in the ground like a tree, with several bough-like wings. Guild Wars 2 gives us the fern hound a leafy dog that grow as companions to the sylvari. Creepers in Minecraft are actually some type of leafy plant monster. According to the creator of the game, they would feel 'crunchy, like dry leaves'. Mooshrooms are funganimals (half-cow, half-mushroom). Resident Evil 2 has the Ivy monsters, man-eating plants that have a vaguely humanoid shape. Supplementary material states that they are created by using the T-Virus to combine both plant and animal DNA. The development blog for The Floor is Jelly describes the catflower as an "unfortunate species" as it hates rain but yet needs to reside in a climate where it constantly rains to survive. The Plant species in Monster Rancher manages to cover both flavors of Planimal, perhaps unsurprisingly. The base monster is a sentient plant, while monsters with the Plant subtype will have plantlike coloration and leafy accents on their bodies. In Kirby: Triple Deluxe, there are a couple of plant-animal hybrid enemies. The insectoid Big Bad ultimately becomes one too, merging with the Dreamstalk to become a colossal wasp/flower hybrid. One of divine power that can entangle and drain the entire world of life. Shovel Knight features the Troupple King and his retinue of lesser Troupples - half trout and half apple. The Sega CD adventure game The Space Adventure has Parrot Grass. An alien spy disguises himself as Parrot Grass late in the game. Plants vs. Zombies 2: It's About Time introduces even more. There are Snapdragons, Toadstools, Guacodiles (Avocado Crocodiles) and Parsnips (parsnip-crabs). Plants vs. Zombies: Heroes, as well as containing three of the above (not the Parsnip) has several Plants that are these, such as Bananasaurus Rex, Hibernating Beary, Pear Cub and Grizzly Pear, Dandy Lion King, and Dark Matter Dragonfruit. All of them are from the "Animal" or the "Dragon" tribe. The Colossal Fossils set adds more dinosaur plants: Tricarrotops and (although technically not a dinosaur) Lima-Pleurodon. The Triassic Triumph update adds even more dino-plants with Veloci-Radish Hunter, Veloci-Radish Hatchling, Apotatosaurus and Aloesaurus. Middle-earth: Shadow of War: Whenever the Spirit of Carnan manifests outside of her forest, she take the form of a tougher variation of a mordor animal made of bark and plantlife. Master of the Monster Lair: A number of enemies, including the spple viper, fireflower, shroomlizard, cursed pepper, taterbomb, etc. Sylvannos from Rivals of Aether, the Atherian forest personified, is a Savage Wolf Animalistic Abomination with a leafy mane, a flower tail, and feet made from tree bark. The Super Mario Bros. series features a variety of planimals, most prominently Piranha Plants, most of which are not full planimals, but Man-Eating Plants. Some specimens, like Petey Piranha or Dino Piranha, however, are full on planimal, having leaves and petals in addition to fully-mobile animal forms. Annyseed bumps into a rather assertive and agitated talking plant, whilst wandering through Hazels herb garden. The little pig inside of Zygaena from Tower of God has a flower that blooms on its back. It grows jewels. In Worm, the Mad Scientist Blasto creates hybrids out of multiple biological samples, using plant DNA to fill in the gaps. This What If? entry discusses what would happen if cows could photosynthesize like plants do. Hanazuki: Full of Treasures has in addition to the Moonflowers, a Chicken Plant. She has a flower on her head, and is rooted into the ground, but lays eggs. Spliced has the Swineapple; it's part pig, part pineapple. Darkwing Duck has Dr. Bushroot, who turned himself into a half-plant, half-duck in a failed experiment. One episode of Krypto the Superdog has Krypto and the Bathound facing off against a half-dog/half-plant villain named Dogwood who tries to bring the trees to life so they can rebel against humanity. Strangely it's not mentioned if he's associated with Poison Ivy, one of Batman's foes and a Plant Person. One episode of SWAT Kats: The Radical Squadron, entitled "Destructive Nature", featured Dr. Viper creating a bunch of "Plantimals" to try and turn Megakat City into swampland. In the episode "Family Appreciation Day", it's revealed that among the inhabitants of the Everfree Forest are Timberwolves. Wolves made of actual timber. They return in "Spike at Your Service" and are part of the set up for the episode's conflict... as well as the resolution. They're also shown to be some sort of spirit, animating piles of scrap wood and fallen branches to form their wooden bodies. The eighth issue of the Legends of Magic introduces similar creatures in the form of lumber bears. These are more or less the same thing as timberwolves — animated and aggressive piles of wooden debris in the shape of animals — except bigger, and resembling bears instead of wolves. In "Apple Family Reunion" there are literal fruit bats, frugivore bats that resemble actual fruits with wings, feet and a head with leaflike ears, fly in a flock resembling a rainbow and inhabit fruit trees. In Ewoks, the Raich from the episode named after it and the strangletorn plant from The Three Lessons appear to be planimals. In "Super Watermelon Island", Steven discovers that the Watermelon Stevens he created way back in the season one episode "Watermelon Steven" have formed their own civilization, and somehow have bred watermelon dogs, chickens, and horses. In "Gem Harvest", Steven deliberately uses his Green Thumb powers on a pumpkin seed, resulting in a pumpkin that behaves like a dog. Rupert made use of this trope in "Rupert and the Hedgehog", where the titular hedgehog was a topiary of a hedgehog that was brought to life when Rupert Bear's friend Bill Badger used too much of the Professor's growth formula on it. Rupert later manages to subdue the hedgehog with the aid of a peacock topiary brought to life. Scientists have discovered a sea slug (Elysia chlorotica ) which eats certain algae and absorbs the chloroplasts, allowing it to perform photosynthesis. Several types of Cnidarians (jellyfish, corals, sea anemones and their relatives) host symbiotic algae that provide them with sugar via photosynthesis in exchange for protection. Certain algae have been known to make their way into salamander eggs so they can feed on the embryo. Instead, the algae can become part of the salamander, giving the salamander algae in its DNA. While they are not true Planimals, a diverse number of animals use camouflage to resemble vegetation. Likewise, many plants, especially orchids, mimic animals, mostly their insect pollinators. Behold, Euglena. It's a single-celled organism that photosynthesizes like an alga, but swims around like a protozoan. Before the kingdom Protista was created and it was realized organisms could be something other than an animal or a plant, botanists, and zoologists used to fight over this little thing to determine whose field of study it belongs to. Even now Euglena is usually found in the first chapters of both zoology and botany books. Speaking about protists, Mesodinium Chamaeleon is a protist that combines both plant and animal biology, being able to eat plants, and then use the chlorophyll granules from the plants to generate energy. "Planimal" cells are a common way to teach basic cell biology to middle-school students, by including features (like cell walls and chloroplasts) exclusive to plants and other features (like lysosomes) exclusive to animals in the same illustration. It simplifies matters and provides a decent teaching tool. Sloths may also count, as they have a symbiotic relationship with moss, which grows in their fur. The moss gains mobility (albeit not that much), while its green color gives the host camouflage. Some scientists have proposed that in a few hundred millions of years, as the Sun's luminosity increases causing the levels of atmospheric CO2 to diminish so much that plants will begin to disappear as they'll be unable to make photosynthesis, both animals and plants could last longer associating with fungi and perhaps with each other—but this would just be a temporary respite before their final extinction.